Why do trees, stockings, and St. Nick = Christmas? Those of us who celebrate Christmas have many traditions that we partake in without even thinking twice about the fact that are actually pretty weird, and any other time of year they would not be socially acceptable. Here's why some of the most common Christmas traditions (that are actually a little strange) were even created in the first place. When you really think about the legend of Santa Claus, it is actually a very unusual tradition. Why is it that only at Christmastime, we teach our children that it is completely normal for an old man in a red suit to break into our houses and bring us gifts? Don't we also teach children "stranger danger?" I'm very confused by who came up with this tradition. Why is it socially acceptable to hang oversized socks by our fireplaces? Not only is this unusual, but it is also a little dangerous to hang fabric that close to a burning fire. And who wants to eat candy that has been inside of a sock? However, there's a famous legend behind the creation of this tradition. There was once a family with several daughters living in poverty. St. Nick came to their town and heard about the family's situation. He came down their chimney, saw their stockings hanging over the fire to dry, and filled them with gold coins. 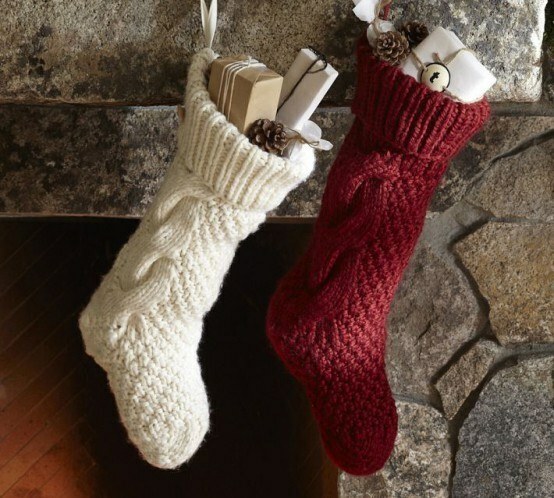 The family was overjoyed when they woke up to find the wonderful gift (source).Thus, the tradition of hanging stockings by the fireplace was born. Drive through any neighborhood in America during the month of December, and you're likely to see at least a few houses with elaborate displays of lights outside their houses. While displaying bright, and sometimes multicolored, lights doesn't seem to have any connection to the Christmas holiday, it has become an iconic symbol of the season. The first Christmas light display was created by Thomas Edison. He showed it for the first time next to a set of train tracks for all of the passengers on board to see. Later, Edward Johnson created the first string lights to be sold in stores around the country (source). Hence, the tradition of creating beautiful lights displays became a lasting tradition. Again, it is only at Christmastime that it is normal to use a live tree as a piece of beautiful home decor, and to decorate that tree with lights and decorations. Any other time of the year, this would not be socially acceptable. It is believed that Germany was the first country in which Christmas trees were brought inside homes, and Martin Luther was the first to decorate a tree with candles as a symbol of the holiday. This was viewed as a strange practice by Americans until Queen Victoria began following this tradition, which led America to practice this tradition as well. Ever since, strings of popcorn have been traded in for strings of colored lights, and ornaments have evolved from being homemade, to being widely produced and sold. Who knew the tradition of Christmas trees simply began as a fashion statement by the queen (source). Regardless of how odd all of these traditions may be, I am so thankful for Christmas festivities such as these that makes this time of year so merry and bright.